The King’s Talks have again been a highlight of the term, with a wide range of speakers being enticed to Canterbury through the networking skills of Owen Moelwyn-Hughes, Head of Politics. 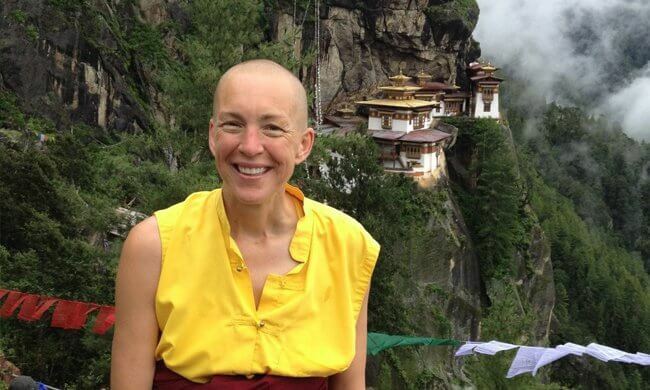 Guests have included Emma Slade, who hails from Whitstable, also known as Ani Pema Deki. A Cambridge and LSE graduate, Emma enjoyed a career as an international banker based in the Far East, but a desire to enquire into the deeper aspects of what it is to be a human being was brought to the surface following a life-changing incident in her hotel in Jakarta, Indonesia where she was taken captive at gun point. This caused her to embark on a journey which led to ordination as the first western woman to become a Tibetan Buddhist monk. Her talk ‘From Banking to Bhutan’ gave a captivating description of Bhutan, the country which she describes as a place where ‘humans are not dominant, but a small part of the whole’. Her charity: Opening Your Heart To Bhutan helps disabled children in that small Himalayan kingdom.